Get a free custom quote. 1″ Thick x 3.125″ Wide Profiled Handrail. Available in 8′, 10′, 12′, 14′, and 16′ Sections. Has a 1-3/4″ wide plow. African Mahogany: African Mahogany can be used as an interior or exterior wood and can be painted or stained. Mahogany is characterized as having straight to interlocked grain and a medium coarse texture. The wood varies slightly in color from a light reddish brown to a medium red. For exterior projects, we recommended African Mahogany. Alder: Clear Alder is characterized by its straight grain and even textures. Knotty Alder could give off more of a ’rustic’ feel. Alders range from light browns with reddish hues. Both the Alders are beautiful interior stain grade materials. Ash: Ash is a coarse grained hardwood famous for its durability and strength. It has own unique beauty and versatility making it a good interior stain grade. White Birch: Birch, characterized by its smooth, fine grain, is heavy, hard and strong material lending both weight and a quality. A great interior stain grade material. Cherry: Cherry is moderately heavy, hard, and strong. Cherry is a smooth-grained hardwood with luxurious, rich red color that deepens with time. It’s a great interior stain grade wood. Hard Maple: Hard Maple is a premier hardwood desired for its clean, white, modern appearance. The wood is characterized as dense, fine textured and close grained. Hard Maple is an excellent interior stain grade material. Hickory: Hickory is a very hard wood known for its strength and durability. The grains are normally straight but can sometimes be wavy. Hickory has a coarse texture, with a great deal of color variation between its white sapwood and contrasting pink to brown heartwood. Hickory is a beautiful interior stain grade material. Poplar: Poplar is a fine-grained, highly-versatile specie. This lumber is light cream to yellowish brown, with occasional streaks of gray or green. Poplar is a ‘softer’ wood. Great for interior, paint grade uses only. We don’t recommend staining due to the versatility in lumber. Red Oak: Red Oak is a strong, heavy hard wood. It has a coarse texture, it is a very ‘grainy’ wood species. Red Oak is a great interior stain grade material. Soft Maple: Soft Maple can be considered a paint grade because of minor mineral streaking. It also readily receives stains or clear-coat to enhance its natural beauty. It has close grains and is moderately hard and strong. We typically considered soft maple our paint grade maple. Spanish Cedar: Spanish Cedar is great for exterior projects. It can also be used inside for applications as well. It has a pinkish to reddish brown color but becomes red or reddish brown upon exposure. Spanish Cedar is durable, light but strong and is a straight grain wood. Walnut: Walnut has exceptional dark luster and rich, smooth grain. It is quite durable and strong. A spectacular species in every respect, walnut truly sets the standard for high-end design. Is it a beautiful interior stain grade material. 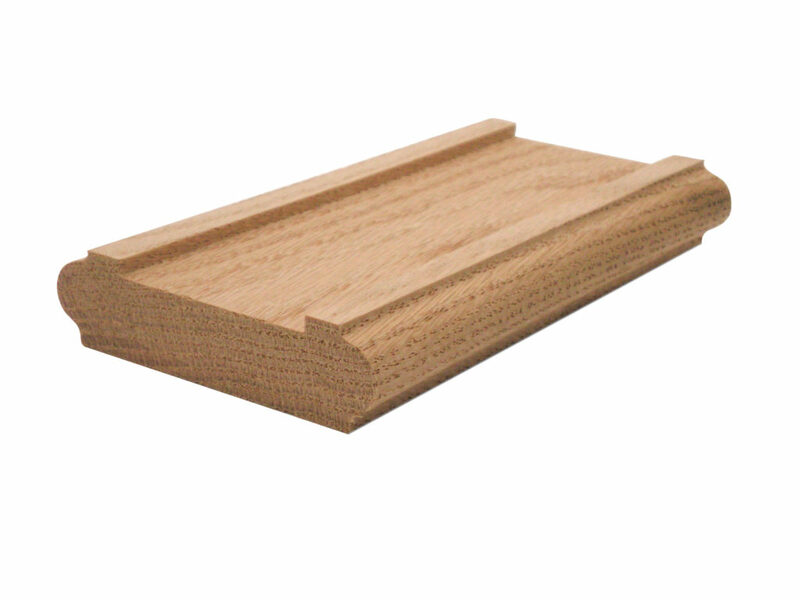 White Oak: White Oak is characterized by a mostly straight and fine grained wood with a medium to coarse texture. It has a light to medium brown uniform color. White oak is a beautiful interior stain grade wood. Sign-up for monthly tips, tricks & inspiration. © 2019 TurnTech All rights reserved. Website Design and Development by WebTek.